Instant City chronicles the life of Karachi – of a city in Pakistan that seems to be the only metropolis and yet the dichotomy lies in it being so backward at times, that even its people fail to recognize it. Karachi has been transformed a lot since the India-Pakistan partition and in many ways that most people fail to see. Steve Inskeep brilliantly writes and captures the essence of the city with its fallacies and successes (whatever little it might have had) and doesn’t become judgmental at any time while doing so. The book is divided into four parts – Jinnah Road, Landmarks, New Karachi and Renewed Karachi. What surprised me about the book was that Steve Inskeep has not left any stone unturned. Karachi is no easy city to write about. It is as good as writing about Bombay or Delhi or Calcutta for that matter – a city just as developing and constantly changing. At the same time, it is questioning itself in many aspects – from the religious standpoint to the new ideas formed by the newer generation. From the brand conscious elite that surrounds the city to the systems and functioning of the government. Steve Inskeep as managed to capture the essence of the modern and the traditional aspects of the city at the same time, which is no easy feat. For a first book, Steve Inskeep sure did make me turn the pages. I was engrossed in the lives of everyday people set against the tumultuous city and its history, present and what the future might bring with it. The writing is structured, though there are parts that could have been dealt with differently, however they do require the detailing. Instant City is a book that also cannot be read in one sitting. It needs thought and breaks with those thoughts. I recommend the book for its writing and its clarity. I also recommend it for the capacity of the writer to go beyond the obvious. This entry was posted in Books, Non Fiction, Penguin Books, Penguin Viking, Review and tagged Instant City, karachi, Life and Death, pakistan, penguin books, penguin viking, Steve Inskeep on November 28, 2011 by thehungryreader. Ok so I read The Girls behind the Gunfire by Trisha Ray in one sitting. It is a fast read and one doesn’t have to think too deep or apply any thought to it, which is very good, considering that once in a while, you have to read something not too heavy. The Girls behind the Gunfire is an action adventure story (Believe it! It is true and it is a decent one at that) about girls and guns (as the title evidently suggests). The story starts with Ritika who is a dork – unpopular and intelligent. She does not know how to behave in social situations and is always made fun of and it is no surprise that she has a secret. Enter: Abhishikta, who is enamored by Ritika’s fact – that she is a lethal super-soldier and gets inducted in the foundation – a secret organization created to serve civilization and not humanity. What then takes place is the unearthing of the Foundation’s control over its soldiers and how they do not have the right to think for themselves (almost been there, done that in various science-fiction books). So here is my take on the book: I liked the way the book was written. The writing was simple and comprehensible. There were parts that I thought I would not get through, however I did – so there was some more editing that the book could have done with. Overall, I enjoyed reading the book. It reminded me in bits and pieces of Orwell and Atwood’s writing, but that is also because of the premise in the second half of the book. At the end of it, I would say that the book can be read once. The writing does not disappoint you and neither the characters. It is a fun read, like I said for the times when something light is required. 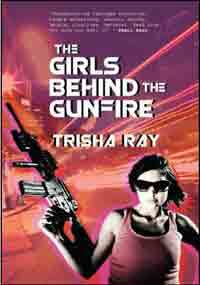 This entry was posted in Books, Fiction, Harper Collins India, Review and tagged Fiction, harper collins india, The Girls Behind the Gunfire, Trisha Ray on November 24, 2011 by thehungryreader. The Dancing Boy struck a chord in me. The time is 1980’s and the setting: Calcutta, which brings out the plot even more vividly. It is not an extraordinary story or something that you will mull on long after finishing the book, however it is one of those books that will make you look up and notice the writing. In the lazy by-lanes of the city, a boy spends hours in front of a mirror, draped in his mother’s saris, entranced by their touch on his skin. Moyur wants to be his twin sister who died before she was born. Moyna talks to him, and urges him to do things. He wants to overcome his oddities and break free from his mother’s expectations and live the life that he wants to. No one understands him but Jojo, his childhood sweetheart, who eventually marries someone else and this changes everything. They both move on with their lives and come back later to where they started from. Relationships are intertwined – Moyur, his wife, Jojo, Boshonti and Shiuli‘s characters emerge strongly from the book. Your heart goes out to them and you almost feel at one with their happiness and sorrows and the complexities that surrounds them. I loved the way Ishani described Calcutta in the book. The by-lanes, the colours, the food, the noise and the air link very well with the story that is being set. For me the book was not a heavy read at all, despite the plot feeling heavy-handed in certain places. The story is simply told and the writing reaches to a wider audience, and doesn’t let go of the plot. I would recommend that you read this book on a rainy or a winter afternoon. It is that kind of a book. Perfect for a day like that. This entry was posted in Books, Fiction, Harper Collins India, Review and tagged calcutta, Fiction, harper collins india, Ishani Kar-Purkayastha, The Dancing Boy on November 24, 2011 by thehungryreader. 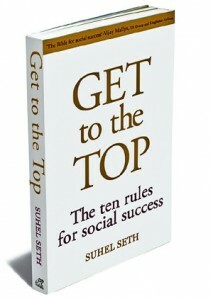 So I finished reading, “Get to the Top” by Suhel Seth is less than a day’s time and was so taken in that I decided to interview him via email. 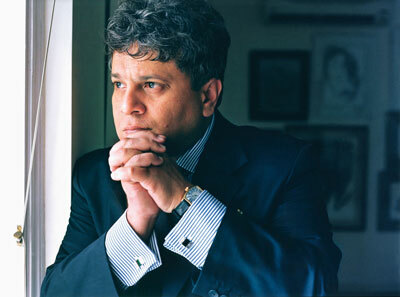 So here is the short and crisp interview with Suhel Seth. You can read my review here. How did you go about the idea of writing the book, “Get to the Top”? Why is there a need for such a book? This was an idea whose time has come. As India and Indians become socially aspirational, we seem to be in such a rush that we forget basic values and niceties. There is a need to re-visit our cultural and social moorings hence this book. There are no steps to being invited: which is precisely what the book says too. But in order to be invited you have to be interested and interesting which is why reading is one critical facet. Loads: from D H Lawrence to Amartya Sen to biographies to Chaucer to Shakespeare to Heller to Ayn Rand. One self-help book that you would encourage everyone to read and why? How are social success and professional success connected? There is only a linkage of satisfaction and of feeling arrived because of social acceptance. A sweet-meat supplier is also successful but would you have dinner with him or invite him over? How important is social networking in today’s world? Do networking sites like Linkedin and Twitter really help a person climb the social ladder? It is important and yes both of these help: we live in an inter-connected world which is why these are so important. What qualities a person would have to possess in order for you to be his or her mentor? This entry was posted in Books on November 20, 2011 by thehungryreader. The Book of Happenstance begins with a loss, as a linguistic specialist’s home is robbed and defaced, with her precious sea-shell collection stolen. While the theft of the sea-shell collection may seem minor, it is this fact that builds the entire story of love, loss, science, language and relationships. 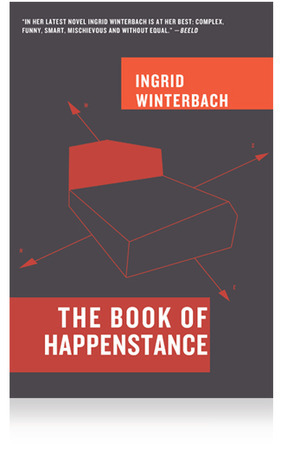 I had never heard of Ingrid Winterbach prior to this book, and now that I have read this book, I will for sure read more works written by her. Helena is a lexicographer of the Afrikaans language. She doesn’t want to do anything else but understand the essence of life, what it means to be alive and why live at all. She wants to know why she is here and why her life matters. For me that struck a personal chord throughout the book, after all, don’t we all want to know that at some point in our lives? Helena’s life is estranged at the same time. She is divorced, rarely sees her daughter, her extended family is dead, and she has had a series of love affairs, trying to make sense of every single one of them. Helena has written a novel which has not been successful. When she gets the opportunity to move to Durban for a project, she jumps at it, only to get robbed after three months and is left devastated. Getting no help from the local police, she decides to solve the theft on her own with the help of her new friend from the Museum of Natural History, Sof. While she investigates, she mulls and ponders over her life – her ex-husband, her losses, her gains and begins to fall in love with her married boss. As events unfurl themselves around her, Helena begins to realize the importance of ‘happenstance’ – the accidents which occur over a period of time to species, which allow them to adapt more successfully than their predecessors. This novel takes the reader on a complex rollercoaster ride. Winterbach has structured the entire novel of course around Helena’s life; however she has masterfully managed to embody the concept of evolution around her life as well. The concept is striking and more so are the words, which are skillfully translated by the author and Dirk Winterbach. While there is a pervasive sense of dread and foreboding in the novel, there is also a sense of hope and wanting to live life to the fullest, which Helena ultimately realizes and wants to figure it all out. Read this book. It might get you thinking. This entry was posted in Books, Literary Fiction, Open Letter Press, Review, Translated Works and tagged Ingrid Winterbach, literary fiction, loss, Love, Open Letter Press, The Book of Happenstance, Theft on November 20, 2011 by thehungryreader.